We were met immediately upon entering the restaurant, and shown directly to our table. As we had a pushchair, we moved to a different table – nice and accommodating. We were asked about drinks, Claire ordered a pink fizz, I requested a glass of merlot (a very good choice!). We were also brought out some water for the table too, which was a nice touch. 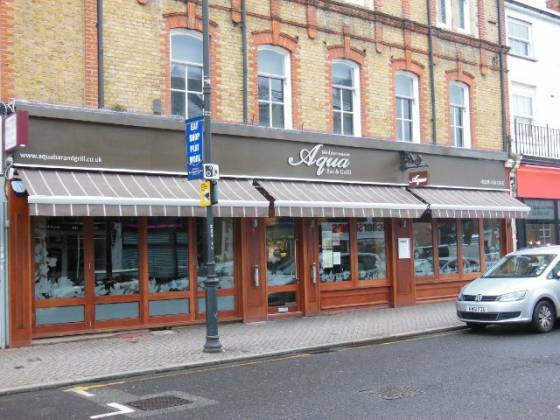 Aqua Bar and Grill have a 2 or a 3 course menu. I’m not a starter kinda guy, much preferring the sweets. Claire, on the other hand, is the complete opposite. Options such as baby spinach salad, soup of the day and deep fried calamari sounded inviting to her. 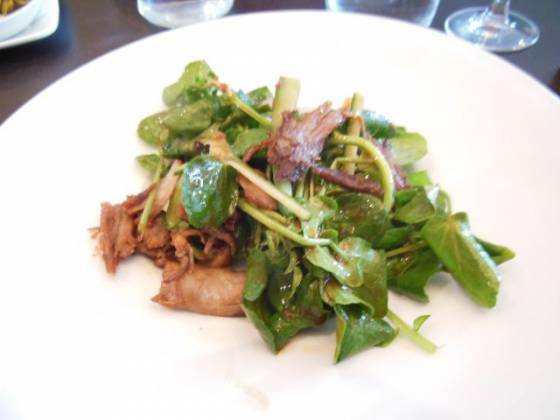 In the end though, she ordered the elegantly sounding crispy duck salad, with cucumber, watercress and hoi sin dressing. She then ordered roast lamb for main (and was asked how she wanted it cooked – medium well). 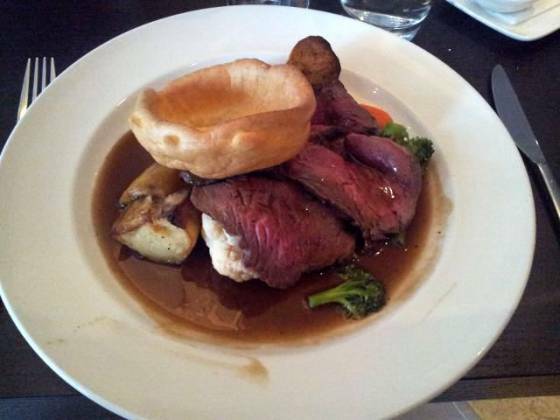 I decided on the roast beef (which came with a Yorkshire pudding), cooked rare. Looking around the restaurant, with dark sultry colours and mirrors, in my eyes it’s was elegant place to eat. I liked that the table was set out properly, with wine glasses, starter and main course place settings and a thick fabric napkin. A few minutes later, a small plate was brought out with olives and sliced bread, as well as balsamic vinegar and oil. A nice small starter for me :-) I’m not normally one for bread and oil, but this tasted fruity and I thoroughly enjoyed it. The duck salad was served shortly afterwards – Claire commented that the ingredients together worked really well as a salad. Our main courses came out swiftly after Claire finished her starter. 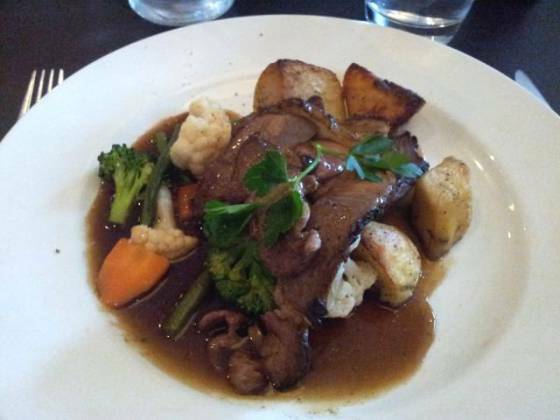 My beef looked good, draped over the roast potatoes and vegetables, drowsed in a thick gravy. A Yorkshire pudding was placed on top. Claire’s roast lamb looked very tempting. I started on the beef first – it was seasoned nicely, and cooked exactly to my request. The meat tasted excellent, and there were around 3 slices – more than enough! Claire really enjoyed the lamb, again cooked to her request. The roast potatoes were okay, not as crispy as I like, nor fluffy inside. It was good to have 4 of them though. The vegetables consisted of carrots, cauliflower, brocolli and green beans. It was good there was a mix, although there wasn’t very much of them and Claire would have preferred a more imaginative selection. They were also seasoned well. The Yorkshire was okay – I prefer them fluffy and “muffin-like”, whereas this one was very flat. It did taste freshly cooked though. Lastly, the gravy. Plentiful and complimented the meal perfectly. After a nice lunch, and with Claire having a starter, I just had to try out the desserts. A few options of puddings were available, including panna cotta and tiramisu. I chose the sticky toffee pudding. A few minutes later, and in a large round bowl, out it came. 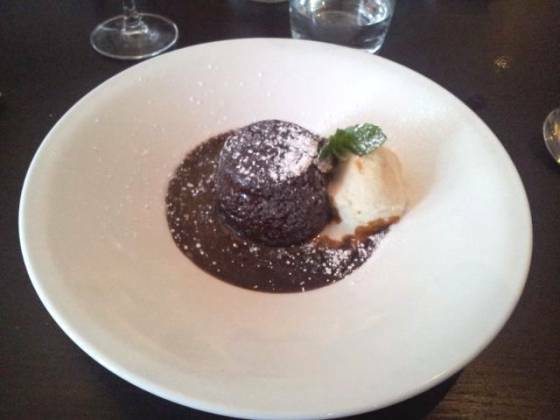 It looked good, the pudding in the middle, with ice-cream and then a moat of sauce. The sponge also contained fruit (either dates or raisins), giving it a nice texture. The sauce was extremely sweet, and what I was looking for! An excellent pudding. A quick note – I was able to use my Gourmet Society Card here previously to get 25% off the whole bill. It only works on the a la carte menu, so didn’t apply for the roast. They did kindly take 25% off the drinks, which I really appreciated! So, on to a conclusion. I really enjoyed the experience here, they know how to cook meat. My beef was exactly to my taste, as was Claire’s lamb. The roast potatoes could have been crispier, and I wasn’t overly keen on the Yorkshire pudding. The gravy was superb though, as was the pudding. It’s not just about the Sunday lunch (which was good), it’s about the little touches: the linen napkins, the (complimentary) bread and olives, the (free) table water and the excellent, friendly staff.